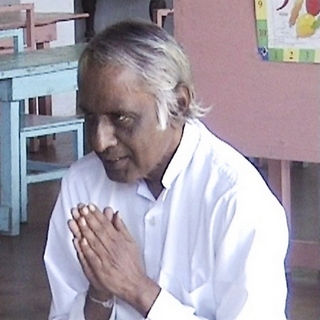 Today is the 13th anniversary since the passing of the well-known Sri Lankan meditation teacher Godwin Samamaratne. Godwin was my first Dhamma teacher and my first Buddhist meditation teacher, and it would be hard to find a better introduction to the teaching. After his passing a few friends began collecting his teaching and we started the Godwin Home Page website, which houses most of the teachings that have been found, including audio fiiles. Recently we republished one of the finest collections of his teachings that was made, The Gentle Way of Buddhist Meditation, which is also available on the website. Some time around the beginning of the year a new blog was started by Friends of Godwin which publishes teachings in short manageable pieces from his various works almost daily, and this has proved to be very popular. His message, which was ahead of his time when he was active, seems to be even more relevant now, and those who have benefited from his teachings grows with each passing year. If Godwin took human rebirth he would be around 12 by now, so if anyone out there has a super-equanimous 12-year old, who keeps good precepts and sits quietly when left to himself… well, that could just be Godwin in a new skin! Acarya Godwin Samararatne was a truly wonderful teacher and person. I only found out about him from your website but was so impressed by his teachings that I downloaded his books and audios of his lectures and am going through them at present. The way he makes the Buddha’s timeless teachings relevant to me, at the present moment in time, and in my present state, as if they had been specifically tailored to my needs, is a completely unique experience for me. I never had the fortune to have sat at his feet and listen to him in person but, thanks to the materials provided in your site, I have been able to benefit from the experience and labours of others who did so and recorded his teachings for posterity. My humble gratitude to you, and everyone else involved, for all your efforts in keeping Acarya Samararatne’s teachings and memory alive. Dear Sanjeev, thank you so much for writing, it makes all the work worthwhile when we know people are benefiting from the teaching. Having met Godwin was maybe the most important thing in my life. He was an example of how humans could be. A kind of hope among injustice, violence and stupidity in this world.